It’s an adventure to climb a tree, but what about trying on a career as an arborist? Learning how to land an arrow just like the legendary Robin Hood? Or letting your creativity flow creekside to create a lasting, nature-inspired work of art? These experiences and more are part of Wildllands Conservancy’s 2016 summer camp, thanks to the power of amazing partnerships with local experts from Joshua Tree arborists, Archery Addictions and Roey Ebert of Roey’s Paintbox. Joshua Tree volunteers their time and talent to take our summer campers to new heights – all while teaching them about what it means to be an arborist. Outfitted just like the pros – full on helmet, harness and safety goggles – our junior-arborists-in-the-making hoist themselves to the top of a tree for a great view – and a surprise sweet treat grabbed from a bucket at the tippy top! Archery Addictions, based in Walnutport, complements our Legends of the Forest-themed week with archery instruction, providing exposure to this confidence-building sport and while showcasing just one more way to enjoy the outdoors. 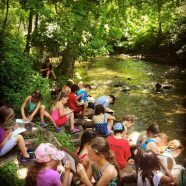 Roey Ebert of Roey’s Paintbox colored our Outside Art camp in the most natural way – by marrying nature and art! Campers sketched alongside the Little Lehigh, worked with watercolor, created a canvas mural of the Wildlands’ logo and even brought to life portraits of Remmy the owl and Cabbage the skunk! Trying on a career as an aborist takes summer campers to new heights! Legends of the Forest campers take aim to learn about archery. This AMAZING mural was created by a group of teens during Outside Art camp.